Spin property behaves like a rotation or vector with some notable exceptions. We will talk about 1/2-spin property most of the time. Half integer spins are those ones bearing manifestly non-classical physical features. Still, some of the features can be viewed at classical compact structures. In fact, discrete quantization is a consequence of the compactness. Herein, we deal with special non-classical quanta, i.e. spins. Practically, spin has some angular momentum, however it is not bound with a (classical) rotation since it would be faster than the speed of light. While it is forbidden by special relativity, the spin itself is fulfilment of relativity conditions. It is done by changing Sum_i a_i^2, i=0,1,2,3 into a square of a sum. It can be viewed as an algebraical condition on itself, with the special relativity as one possible source of it. Theoretically, it can be described like a vector that changes its sign under 2pi rotation. It is a spinor, an object that is a tensor of 1/2 order (for 1/2 spin). It means that the tensor product on two spinors yield a vector. Spinor arises with 2-1 mapping from SU(2) onto SO(3). It is notable, the relativity condition leads into a more complex object that comprises spinors for a particle and its anti-particle. Usage of ladder (creation/annihilation) operators on a compact linearily ordered space of possible states results in two-fold discrete conditions. We have either an even on an odd amount of states. In the case of angular momentum property, we have either classical angular momentum (for an odd amount of states) or nonclassical property - spin (for an even amount of states). It is an algebraic road to spin. In the theory of coherent states, we end up with a cohomology defined with a help of a ball surface. We have an expression of exp(i * spin * oriented area) where the area is determined by some three vectors on the unit ball. The oriented area can be taken as the 'inner' or the 'outer' one. Since we want to have it unambigous, the spin times area difference (the whole ball surface) should be k*2pi. Thus we can have half-integer spin. Half-integer spin systems undergo somewhat peculiar properties. 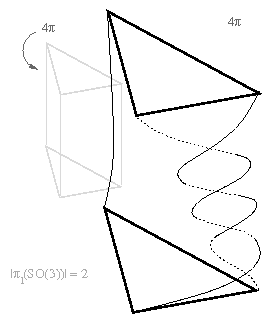 First, their description by a wave function changes its sign when an object is 2pi rotated. It comes about the same when two objects interchange. Its direct consequence is the exclusion prinicple and thus the existence of chemistry and life as well. Together with it, we know such objects are described by spinors. It is a perpetual challenge to find some natural models and explanations for that. Moebius strip is a closed strip with its two ends connected under 1pi rotation. It is non-orientable manifold, it has just one surface. Going along the strip for 1pi, we come to the initial point but at the other direction. Only the second turn ends with the initial position. Another easy model is a two-coin system. Rotating one coin around the other needs 4pi rotation of the rotated one, 2pi is just an interchange. Take a cup of tea into your hand and rotate your hand. Your hand is longitudinally 2pi rotated after a 2pi rotation of the cup without spilling it out. You have to do another 2pi cup rotaion to release your hand. It is so since path of a 4pi rotation can be shrunked into the identity, contrary to a path of just 2pi rotation. This topological fact about homeomorphisms is used for Hein's tangloid game. It results in im/possibility of untangling them. A tangloid is a pair of (wooden) pieces connected together by 3 or more ropes. 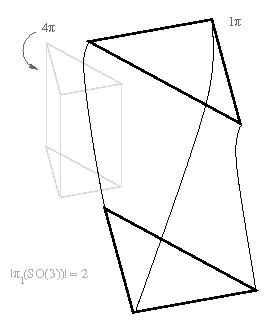 Rotating one of the pieces by 2pi results in a tangled structure that can not be untangled without another rotation. The same structure is a result of an interchange of the two pieces. While 4pi rotation looks even more entangled, it can be untangled by just moving ropes along. The 4pi rotation works for any number of objects. Interchange property needs scarf-like connections than. 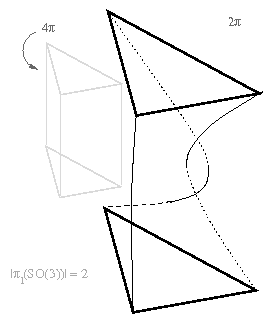 Untangling the tangloids can be done according to Weiss's construction. Model one object by a small ball, and the outer object by an outer ball. Grow the ropes along making the (4pi) rotation. Since path of a 4pi rotation can be continuously shrinked to the identity (straight ropes) we have the untangling as a (continous) sequence of detangling structures. Note that no rope crossing occurs since we use just paths of (some) rotations. Both the standard physics of particles and structure properties of tangloids are based on Lie groups and Lie algebras. First, a group is a set endowed with three operations: neutral element (nullary one), inversion (unary one), and group multiplication (binary one). Second, manifold is a structure that is part-wise continuously parametrized. Lie groups are smooth combinations of the properties, with Lie algebras being linearization of the structures. Most used Lie structures are spaces of matrices. Take square matrices of some rank n above some field, usually real or complex numbers, with non-zero determinant. It is easy to see they form a Lie group, called SL(n). Real orthogonal matrices with det=1, SO(n), and complex unitary matrices with det=1, SU(n), are two other examples. Their derivations at the neutral element yield Lie algebras, here antisymmetric, antihermitian matrices respectively. Some common usage of Lie structures in physics are evolution equations. Take a (complex) phase space. Having superposition, we have linearity. Possibility of evolution decomposition into time slices together with time reversion provides us with group structure. Continuity of development results in manifold structure. Thus we have a Lie group, SU(n) for constant volume systems, as the evolution operator. It simply holds for quantum mechanics as well. 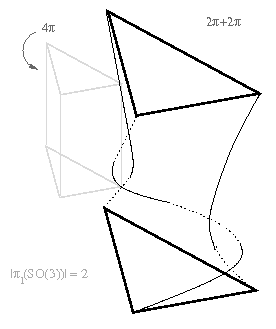 SU(2) group is homeomorphic to S_3 sphere and thus it is simply connected. 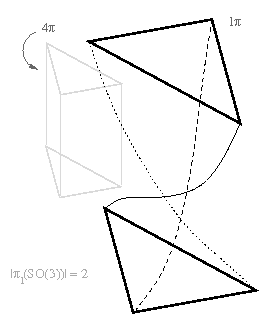 Lie algebras of su(2) and so(3) are isomorphic and thus SU(2) and SO(3) are locally isomorphic. The group mapping is 2-1. Complete path of a 2pi rotation at SU(2) is mapped onto a twice long (4pi) rotation at SO(3). It is the reason why path of 4pi rotation at R^3 is homeomorphically shrinkable to the identity. The 2pi - 4pi distinction can be viewed with help of projective spaces as well. Properties of systems of particles are described with the help of the symmetric group S_k. It comes about as the fundamental group of a space of paths obeying some properties. Take a real space R^n for n>=3, and a k-tuple of different points of the space. Now make closed paths of the k-tuple. Since we deal with indistinguishable particles, the paths can be connected with points interchanged. The S_k group of point permutations is the group of inter-transformable paths.